Need information about our dining facilities? You'll find it here. Jack Magee's Grill, named after the iconic Bowdoin track coach, serves a varied a la carte menu including burgers, sandwiches, and salads. Between meals and in the evening, students on board plans may use their meal plan points as well as OneCard. Jack Magee's Fast Track is a weekday express lunch operation which allows board plan or OneCard payment for a "grab and go" menu of limited sandwich and pizza options. 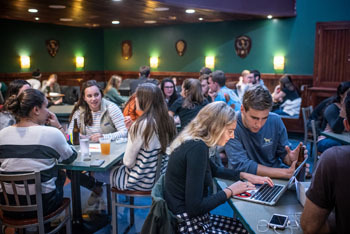 Magee’s Pub provides an informal gathering place for members of the College community. It is open two to three evenings a week during the academic year as a venue for all students. Many performers are booked in the pub, such as singers, bands, comedians and DJs. Beer and wine are available for those 21 years of age or older; proof of age is required. All state and College regulations concerning the sale and consumption of alcoholic beverages are strictly enforced, and students who violate these rules are subject to disciplinary action under the Social Code. 11:15 a.m. - 3:00 p.m.
8:30 p.m. - 1:00 a.m. 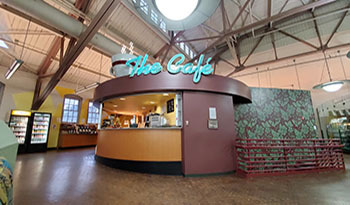 The Café, located on the upper level of Smith Union under the huge coffee cup, offers hot and cold beverages, baked goods, and lunch items. Popular choices include locally made bagels, premium local and free-trade coffees and teas, and delicious breakfast sandwiches. The Café is generally open for breakfast, lunch and in the evening. Between meals and in the evening, students on a regular board plan may use their meal plan points as well as their OneCard funds. 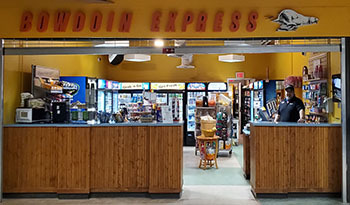 Day: 7:30 a.m. - 4:30 p.m.
Day: 11:00 a.m. - 4:00 p.m.
Conveniently located on the lower level of Smith Union, Bowdoin Express offers a wide selection of soft drinks, juices, and snacks including many healthy and local options. Non-food items such as soaps, shampoos, and other toiletry items are available for purchase on a cash or OneCard basis. Students may purchase food and beverages with their meal plan points as well as OneCard. 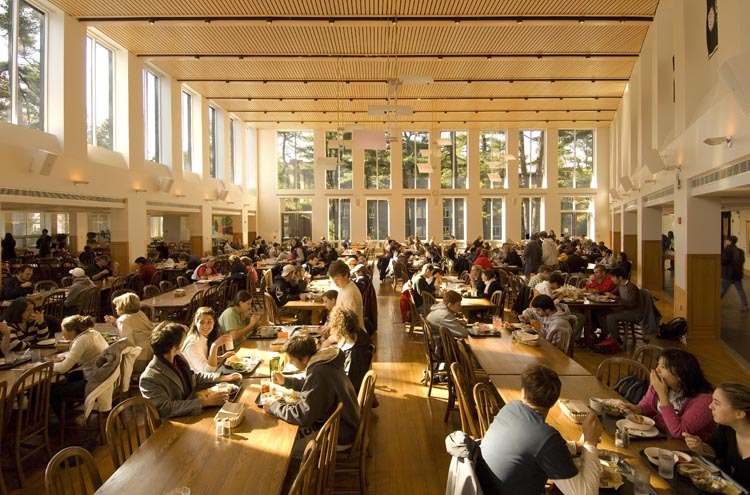 The largest dining hall at Bowdoin, Thorne Hall, has soaring ceilings, avant-garde lighting, wooden refectory tables and views of the tall pines that tower over the campus. Formerly known as Wentworth Hall, Thorne serves breakfast, lunch and dinner on weekdays and brunch and dinner on weekends. Its larger size makes it the perfect gathering place for the popular SuperSnack meal on Thursday, Friday and Saturday night. 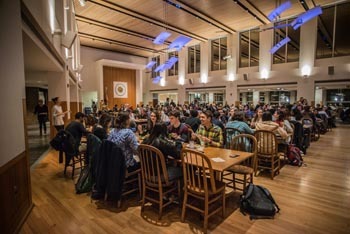 Large campus events are often held in this dining facility. Lunch: 11:30 a.m - 2:00 p.m.
Brunch/Lunch: 11:00 a.m. - 1:30 p.m. Located in the heart of campus, this busy dining hall serves breakfast, lunch and dinner weekdays and breakfast, brunch and dinner every weekend during the academic year. Bowdoin students have strong affection for Moulton’s cozy interior and also enjoy the MU Express take-out lunch and dinner option available here. Hot Breakfast: 7:15 a.m. - 9:00 a.m.
Continental Breakfast: 9:00 a.m. - 10:30 a.m.
Express Lunch: 10:30 a.m - 2:30 p.m.
Express Dinner: 5:00 p.m. - 8:00 p.m.
Breakfast: 9:00 a.m. - 11:00 a.m.
Brunch/Lunch: 11:00 a.m. - 12:30 p.m.